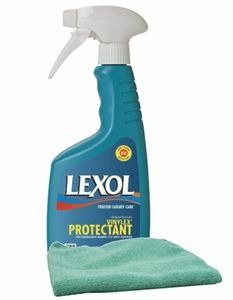 Lexol Vinylex Protectant is a patented formula for the care and preservation of vinyl, rubber, and plastic surfaces. It is a state of the art protectant that combines cleaning, protection, and beautifying properties. It penetrates below the surface to restore the underlying plasticizers. Filters out damaging UV rays while protecting the surface from fading and cracking. BONUS: Comes with a large microfiber cloth that is great for polishing and buffing all paint surfaces (color may vary).